Marian Turski has more than defied the terrible odds stacked against him in his youth. Here his granddaughter Klaudia shares her perspective on her grandfather. As a high school student in Illinois, USA, I often phoned my grandfather, Marian Turski, to discuss what I was learning in my European history class. To my 15-year-old self, the French Revolution was abstract, but a conversation with my grandpa in Poland brought it to life. At that age, I had no idea about the things that he was doing on the other side of the ocean – my world was the United States; plus, universal teenage dramas clouded my mind. Poland was barely a part of my identity. We could not have had more different teenage years. He grew up in the city of Łódź, then the second largest city in Poland. When my grandpa was the same age that I was nonchalantly paging through a European history textbook, he was forced to live in the Łodź ghetto, robbed of any semblance of a ‘normal’ adolescence. He and his family lived in an apartment in the ghetto with two rooms and a kitchen. One room housed the hosts, a family of four, and the second room housed his family – also a family of four. His aunt and her daughter lived in the small kitchen. There was no toilet; they had to go to the courtyard. “But still, for the ghetto, it was not a bad house,” he says. Until the beginning of 1941, there were functioning schools inside the ghetto, so my grandpa was able to complete two years of high school while being there. 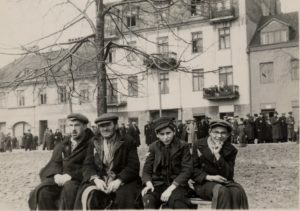 Far right: Marian Turski on a bench in the Lodz ghetto during WW2. Unlike other ghettos, the Łodź ghetto was fully sealed. It was practically impossible to escape. And unlike the Warsaw ghetto, there was greater security along the Łódź ghetto’s perimeter, as well as orders specifically prohibiting commercial exchanges between Jews and non-Jews. Jews caught on the Aryan side would be shot. Also unlike Warsaw, many Germans were living around this ghetto, and they were loyal to the Nazis. My grandpa has such experience and wisdom, he sees things that most other people don’t. For example, he is concerned about a possible ‘Polexit’ – more in symbolic terms than in actual reality – and the implications such an estrangement can have. He recalls that British and French people, back in 1939, would say, “Why should we die for Danzig?” Poland, he recalls, “was alone, totally alone.” He believes that Poland needs to be a good partner in order to prevent something like that happening again. “We need to convince our allies that Lithuania, Latvia or Estonia are almost a part of Britain, France or America,” he says. “But if you lose the sympathy of great allies, then their people will say: ‘Why should we die for them?’” Good alliances, he says, require engagement and dialogue. They also need leaders with a strong sense of moral leadership and perspective, and he bemoans the lack of such leaders today. “A politician is a man who looks at the short term,” he says. “A statesman should foresee the great dangers to Poland, and how to effectively prevent them.” Good leaders, he states, also look for consensus. 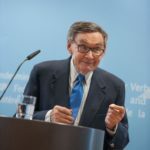 And consensus, he emphasizes, can only be reached by compromise – something, he strongly believes, today’s politicians would do well to keep in mind. Andrzej Duda, Marian Turski and Dariusz Stola tour the POLIN Museum. Photos: Photo archive of the Prince of Whales, Magdalena Starowieyska (POLIN Museum), Polityka, Marek Edelman Dialogue Center.